The aging face is the result of both superficial textural wrinkling of the skin and changes in the underlying structures. 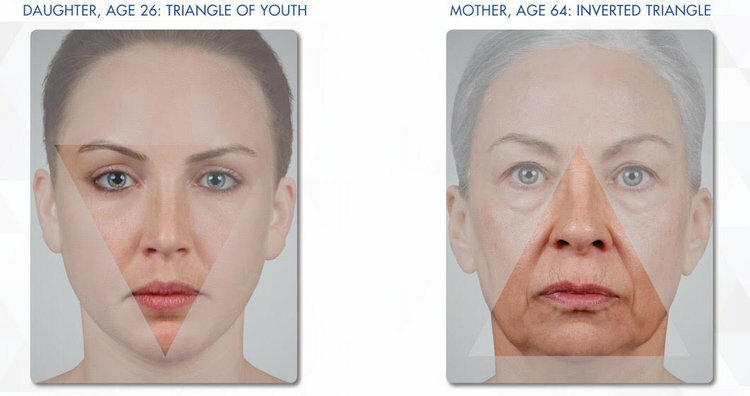 The major forces contributing to facial aging include gravity, skeletal remodeling, fat loss and redistribution, hormonal imbalance, chronic solar exposure and other environmental factors. Each one of us will experience these changes differently because of genetics as well as our lifestyle. We're going to discuss the different causes and also briefly touch on what treatments are available. The triangle of youth is an upside down triangle as illustrated in the photo. This upside down triangle represents fullness in the mid to upper face. In our youth, we have plenty of fat in the face in particular in the forehead, temple area, around the eyes, in the cheeks and around the mouth. The most definitive features of youth in regards to subcutaneous fat (facial fullness) are lateral cheek projection or The Ogee curve, the arc of the jawline and the arc of the forehead. Also convexities of the temple area is another feature of youth. With fat loss or fat redistribution, these defining arcs and convexities of youth are disrupted. For example with age, the malar or cheek fat pad gradually slides forward and down to bulge against the nasolabial crease giving rise to the prominence of the nasal labial fold. The loss of underlying subcutaneous fullness is responsible for soft tissue dissent and relative excess of facial skin. Dermal filler's are a great option to consider when re-volumizing these areas of concern. Our goal with facial rejuvenation is to restore the balanced distribution of facial fullness that exemplifies a natural youthful face. In the aging face, craniofacial skeletal changes occur as a result of bone atrophy and bone loss. Because of changes in the maxilla and mandible, there is even a reduction in facial height. This leads to the loss of youthful proportions of the face, especially in lower face. For example the orbits increase in size for the eyes. This makes the eyes look sunken in and allows fat to protrude. The maxilla decreases in size which leads to loss of support in the upper lip and contributes to perioral wrinkling. Because of loss of bone in the mandible the shape and projection of the chin changes with age as well as the loss of definition of the jawline. Skin textural changes and discoloration reflects the cumulative effect of time on the skin. Sun damage is the single biggest culprit in aging skin. Overtime the breakdown of collagen and elastin fibers causes the skin to sag, stretch and lose its ability to rebound. The skin also bruises and tears more easily and takes longer to heal. Even though most damage has already been done you can delay continued changes associated with aging by avoiding sun exposure, using sunscreen daily. covering up and wearing a hat. Research has suggested that discoloration or an uneven skin tone can add 10 to 12 years to a person’s age. Pigmentary changes have long been considered a cosmetic problem. According to some surveys 47.3% of patients with pigmentary disorders admitted to feeling self-conscious about their skin, 32.7% felt unattractive because of their skin and 32.7% made an effort to hide pigment changes. Treatments that are available to address discoloration and uneven skin tone are IPL (photo facials), chemical peels and dermal infusion facials. Repetitive muscle activity can create permanent creases in the skins surface. These lines are most evident in the forehead, glabella (between the eyebrows) and crows feet. Wrinkle relaxer's such as Botox and Dysport are great options to treat these wrinkles. Our goal with facial rejuvenation is to restore the balanced distribution of facial fullness and smooth even-toned skin that exemplifies a natural youthful appearance. 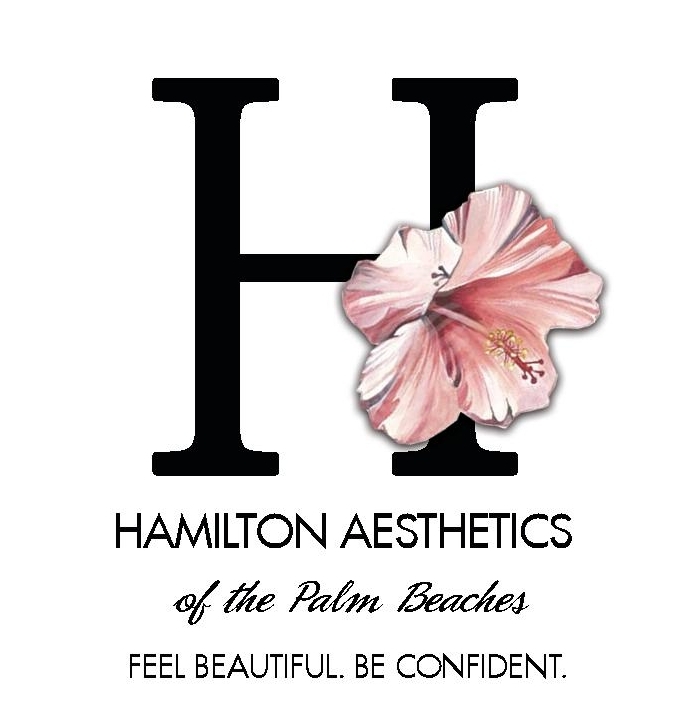 Because of all the great advancements in Aesthetic treatments, we have the ability to slow the effects of aging and to prevent the effects of aging. Even though most changes in the aging face are universal they do not have to be inevitable.